Standard - $40.99 Only 8 left! Why is a cape great? Well, first, for practical reasons, it covers up your shoulders and back without any of that restrictive sleeve business, leaving your arms free for stuff like...cool inside hand-shakes between you and the rest of your night-dwelling buddies, and...entertaining shadow puppets that make everyone laugh, and...powerful gestures that punctuate your declarative speeches! Second, a cape makes it really easy to look super smooth and dramatic when you turn and leave a room. Think about it: One quick turn of the heel and the cape flies up and makes a swishing sound and floats in the breeze and everyone's who's watching can't help but be all "OH WOW SO DRAMATIC"! Third, a cape makes you stand out. Not just any bozo can pull off wearing a cape...when people see you wearing one, they see a dude who's not afraid of a little pizzazz, dig? So you need this. 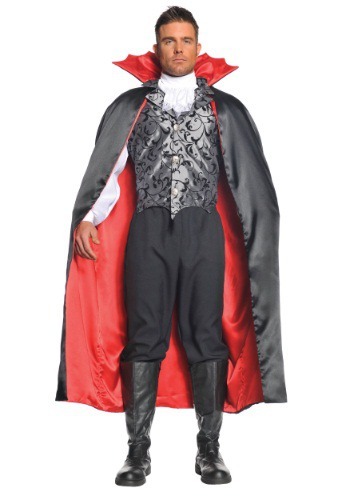 You need this because every decent, self-respecting, inner-loving vampire needs a cape to call his own. It's practically a vampire's signature calling card! And since you probably can't turn into a bat or do any of those other vampire tricks (wait...are there other vampire tricks? ), you should wear this Deluxe Vampire Cape so everyone will be so taken with what you're wearing they even won't ask you to do any transformations (which we can now go ahead and add as the fourth Pro to the list of Why Capes Are Great)!